Join us in discovering Oahu’s #1 most popular public attraction; be sure not to miss any of the historic sites, features and attractions. Explore a full day at the Pacific Historic Park that includes the USS Arizona Memorial, USS Bowfin, USS Battleship Missouri and the Pacific Aviation Museum. Then take a drive through Punchbowl and historic downtown Honolulu. This is the hassle free way of having guaranteed reserved movie and shuttle tickets to the USS Arizona Memorial. Skip the lines to get tickets for the Bowfin Submarine, Pacific Aviation Museum and the USS Missouri Battleship. Includes a Special Lunch at Pearl Harbor. Join us in discovering Oahu’s #1 most popular public attraction; be sure not to miss any of the historic sites, features and attractions. Explore a full day at the Pacific Historic Park that includes the USS Arizona Memorial, USS Bowfin, USS Battleship Missouri and the Pacific Aviation Museum. Then take a drive through Punchbowl and historical downtown Honolulu. 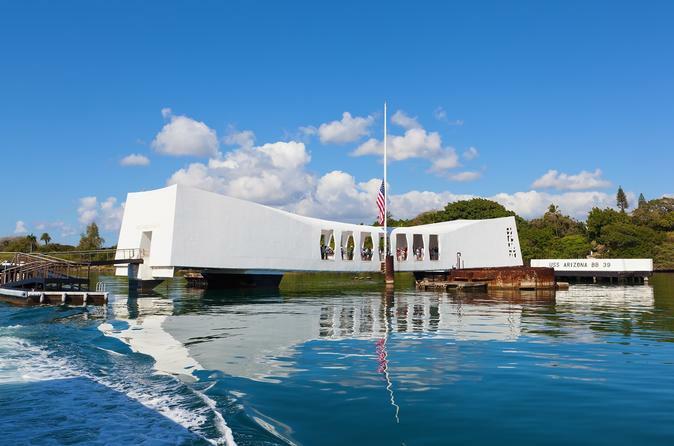 This is the hassle free way of having guaranteed reserved movie and shuttle tickets to the USS Arizona Memorial. No waiting in long lines to get tickets for the Bowfin Submarine, Pacific Aviation Museum and the USS Missouri Battleship.